BRT International is a logistics solutions company with a wealth of UK & European multimodal & bulk liquid transport experience. We have over 25 years of UK & European transport knowledge and experience. We deliver the best possible service for your company based on an old fashioned ethos of hard work, modern working practices and the most up-to-date IT & telecoms available. BRT International offer a full UK container & ISO tank haulage solution via our own fleet, in conjunction with a complete UK rail service. We offer services to all shipping lines and merchants to include large and small volume container & ISO tank shipping, as well as spot jobs handled via road & rail. We aim to deliver your logistics requirements on time and on budget. As well as being specialist to the container & ISO tank industries, we also have a wealth of knowledge in transporting general goods via flat, tautliner, temperature controlled & box semi-trailer haulage, for outbound and reverse logistics. BRT International offer a full UK container rail solution. We can rail ex all major UK container ports (& vice versa), for your spot or volume consignments. We will aim to deliver the shipment to nearest rail terminal as possible to your warehouse door, in order to minimise the road journey to your site. BRT International offer full Devan & Vanning operations and can provide you a solution to any other requirement you may have. If your goods are coming in or moving out of the UK via overland trailer or container, then we can assist in you in transporting the goods to our facility. We can provide a variety of containers to suit your needs. We can provide brand new, nearly new, or end of life 10FT, 20FT or 40FT containers for a variety of purposes. We can tailor to suit your needs, with or without CSC plating. 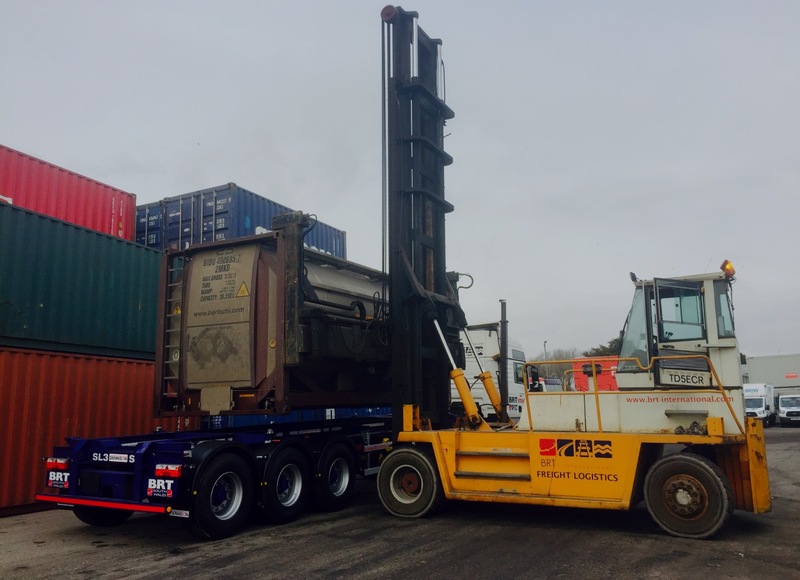 We can supply, deliver & lift your container into position on your site. BRT International are a first choice logistics provider for the general haulage and chemical industry around the UK and Europe. We strive to meet and exceed both our customers and legislative requirements. BRT International deliver the best possible service for your company based on an old fashioned ethos of hard work, modern working practices and the most up-to-date IT & telecoms available. We are proud to serve many Blue Chip customers who operate in various industries including food, chemicals, aggregates and heavy industry. The BRT International team’s promise to you is to offer a professional, reliable service to you 24/7. We are now ISO 9001:2015 accredited. SQAS to be introduced in 2019. Our empty container handler (up to 9 ton) can lift the whole ranges of container sizes and stack up to 4 high. We carry wet and dry hazardous cargo for the following classes: 2, 3, 4, 5, 6, 8 and 9. We have our own DGSA available on request.